A line of burned out abandoned cars sit on the road after the Camp Fire moved through the area on November 9, 2018, in Paradise, California. The 20 warmest years ever recorded have been within the last 22 years, and the four warmest of those have been 2015, 2016, 2017 and 2018, according to the World Meteorological Organization (WMO). The WMO has stated that if these trends continue (and there is no reason to believe they won’t), global temperatures may rise from between 3-5 degrees Celsius (3-5°C) by 2100. The organization warned that if humans exploit all known fossil fuel reserves, “the temperature rise will be considerably higher” than even those catastrophic levels. “It is worth repeating once again that we are the first generation to fully understand climate change and the last generation to be able to do something about it,” WMO Secretary-General Petteri Taalas announced in a recent WMO press release. Yet even with this stark wake-up call, it may well already be too late, given that we are already living in the Sixth Mass Extinction. A study published earlier this year, conducted by an international team of researchers from 17 countries whose findings were published in Nature Geoscience, showed that global temperatures could eventually double those that have been predicted by climate modeling. The vast majority of governments around the globe are responding in ways that range from laughable to pathetic, given the consequences that are upon us already. 2018 has been yet another year of records and alarming developments as runaway climate change continues apace. Here are ten significant climate-related phenomena from 2018. The Arctic sea ice is close to historic lows in both extent, volume, and mass. 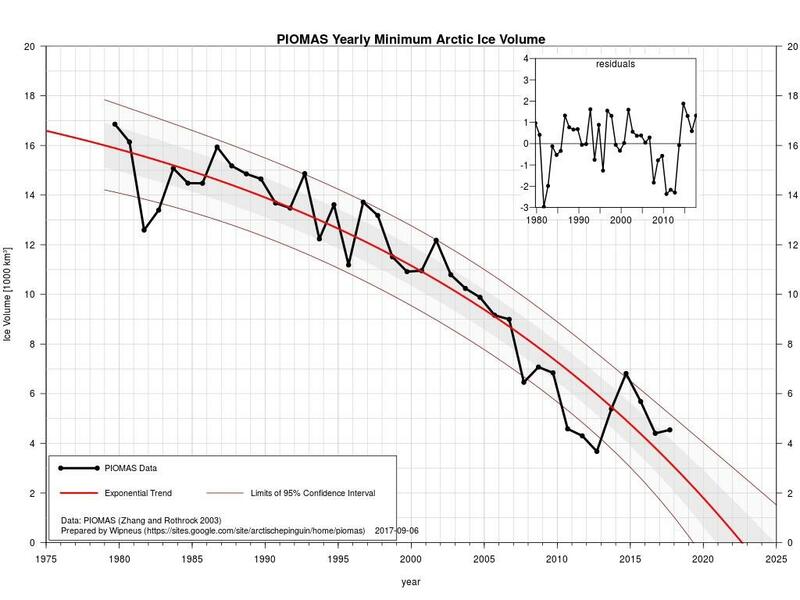 The annual minimum Arctic ice volume, based on observations (not projections), is following a trend that shows we should expect periods of an ice-free Arctic Ocean in the summer by 2023, and possibly sooner. World-renowned Arctic Sea Ice expert Peter Wadhams predicted this during an interview with Truthout. Warm temperatures have become the norm in the Arctic, so the now increasingly rapid loss of sea ice should come as no surprise. Some of the ground in the Arctic is not even freezing any more, even during the winter. Warm temperatures have become the norm in the Arctic. Militaries from around the world, particularly from the US and Russia, are racing to stake claims in the region and project their presences there in order to advantage of the fragile Arctic region for exploitation of oil and gas reserves, as well as those countries actively exploring shipping across the increasingly accessible region as the sea ice continues to melt away. The loss of Arctic Sea ice will lock in several runaway climate feedback loops that will dramatically altar global climate, causing water availability and food-growing capacity to be severely diminished across large swaths of the planet. Earth’s oceans have already absorbed 93 percent of the warmth humans have generated since just the 1970s. To give you an idea of how much energy that is, if you took all of the heat humans generated between the years 1955 and 2010 and placed it in the atmosphere instead of the oceans, global temperatures would have risen by a staggering 97 degrees Fahrenheit. We continue pumping CO2 into the atmosphere, 25 percent of which continues to be absorbed by the oceans, along with the heat the CO2 traps in the atmosphere. 2017 was the second warmest year ever recorded for the oceans, and according to NASA, the five hottest years ever recorded for the oceans have occurred since 2010. The oceans are thus becoming increasingly warmer and more acidic with each passing day. And Australia’s Bureau of Meteorology warned this November the “chance of an El Niño forming in the coming months is 70 percent,” which would bring warmer than normal ocean temperatures. One extremely worrying development in the Arctic came in the form of bubbling lakes. A report showed that large numbers of lakes across the region were leaking methane, a far more potent greenhouse gas than CO2. In what is perhaps a harbinger of things to come, one lake in particular was found to be bubbling vigorously as methane from below escaped through the lake and into the atmosphere. These lakes that are bubbling from methane being released from the thawing permafrost beneath them don’t completely freeze during the winters, which causes them release even more methane as the permafrost does not reach the cold temperatures it had prior to this phenomenon. Hence, another runaway climate feedback loop is born. This distressing development comes on top of numerous other feedback loops in the Arctic that have already kicked in. More bad news about methane came in the form of a report illustrating how large amounts of methane (up to 41 tons daily) were being released from a glacier in Iceland via its meltwater. This is an amount equal to the methane produced by more than 136,000 belching cows. Wildfires, amped up by climate change, ravaged many regions of the world in 2018. California saw its most destructive wildfire on record, surpassing the previous record set only the year before, as scores died from incineration that likely released radiation and toxic chemicals into the air in Southern California. Wildfires across Canada’s British Columbia, as well as other parts of that country, were the largest ever for the second year in a row. Wildfires across Queensland, Australia during November were unprecedented, given that the area is technically a rainforest, and it was springtime there. Nearly 100 people died in wildfires in Greece, in what turned out to be Europe’s deadliest forest fire in over a century. Insects, and hence the global food web, are in crisis, according to several studies, one of which was published earlier this year. A study published this October in the Proceedings of the National Academy of Sciences (PNAS) showed how massive the collapse of insects is, and that it is far more widespread that previously known. Climate change is implicated as the leading cause. Insects, and hence the global food web, are in crisis. This comes on the heels of a study from last year showing a 76 percent decrease in flying insects in the past few decades in nature preserves across Germany. This was a dramatic uptick from a 2014 study by an international team of biologists which estimated in the previous 35 years the abundance of invertebrates like bees and beetles had decreased by 45 percent. Everywhere long-term data on insects is available, particularly across Europe, the numbers of insects are plummeting. Without these pollinators, which are being annihilated, the already beleaguered global food production system is in even greater danger of collapse. The global food system is already broken, according to the 130 of the world’s science and medicine academies. The likelihood of simultaneous crop failures for the four biggest corn exporters (US, Argentina, Brazil, Ukraine) suffering yield losses of 10 percent or greater increases from 7 percent at 2°C warming to 86 percent at 4°C. Staggeringly, nearly one billion people went hungry last year. This number is guaranteed to climb, due to worsening climate impacts as atmospheric CO2 content continues to increase and the nutritional value of crops decreases as the result. As Truthout reported earlier this year, two studies investigating corn and vegetables warned of an increasing risk of food shocks around the world, along with malnutrition, if climate change continues unchecked. Both studies, published in the Proceedings of the National Academy of Sciences, showed how climate change will increase the risk of simultaneous crop failures across the planet’s largest corn-growing regions, as well as sapping nutrients from critical vegetables. For example, an increase of 4°C — which is essentially the current mid-range trajectory we are on to reach by 2100 — could cut US corn production nearly in half. Meanwhile, the likelihood of simultaneous crop failures for the four biggest corn exporters (US, Argentina, Brazil, Ukraine) suffering yield losses of 10 percent or greater increases from 7 percent at 2°C warming to 86 percent at 4°C. Another study warned of how climate change already poses a serious threat to the nutritional value of crops, and a lack of action could well have major global implications for both food security and global health. The same study showed that global crop yields could be reduced by nearly one-third with a 4°C temperature increase. Still suffering from the impacts of a devastating Hurricane Maria, Puerto Rico was officially left to its own devices to recover. The country has been physically, socially, and psychologically devastated as tens of thousands of people have struggled to survive without electricity, health care or basic services long after the reconstruction of the island should have taken place. Another example of this in the last year was Florida’s panhandle, portions of which were obliterated by Hurricane Michael. Government aid was slow to arrive. Meanwhile, increasingly intense and extensive heat waves, coupled with broadening drought, and climate change forecasts showing more of all of these, revealed that countries across North Africa and along the Persian Gulf will become literally uninhabitable in the not-so-distant future. Rising seas infiltrating water tables, and thus contaminating many people’s drinking water source, are also going to be a large factor in this equation. A record heat wave in Queensland, Australia, in November shattered the previous high temperature record by a stunning 5.4°C. The heat wave alarmed scientists, raising fears of another bleaching event that could further weaken the already beleaguered Great Barrier Reef, the largest coral reef in the world. In the Paris Climate Change Agreement, global governments pledged to try to keep warming within a limit of 1.5C above pre-industrial levels. The heatwave increased already above-average marine temperatures, driving up the likelihood of the coral once again dying off in the overheated waters. Marine heatwaves in 2016 and 2017 already killed off and/or damaged large regions of the Great Barrier Reef, as scientists worried about the fact that without breaks in the annual heatwaves, the coral will not have a chance to recover. The scientific consensus shows that coral reefs typically need a minimum of 10-12 years to recover from bleaching events. However, climate change is causing the bleaching events to occur on nearly an annual basis now. Hence, a 2011 NOAA report warning that the planet could lose most of its coral reefs by 2050 is looking increasingly like an over-conservative projection. Additionally, with scientific institutions already warning the odds are high that another El Nino could occur next year does not bode well for Earth’s already overheated oceans. A landmark UN report released in October served as an imminent warning that if governments fail to act swiftly and dramatically (and within the next dozen years), droughts, flooding, and increasingly extreme heat waves will increase drastically. In the Paris Climate Change Agreement, global governments pledged to try to keep warming within a limit of 1.5°C above pre-industrial levels, in order to prevent increasingly catastrophic impacts. In the recent UN report, experts stated that without urgent and unprecedented changes, meeting the 1.5°C limit would be impossible. The report pointed out several important thresholds: just an extra 0.5°C of warming beyond 1.5°C would essentially completely annihilate corals and dramatically accelerate the loss of what is left of the Arctic sea ice, and the proportion of the global population exposed to water stress would be at least 50 percent higher. Additionally, at 2°C warming, extremely hot days would become much more common, there would be more forest fires and the number of heat-related deaths would increase. Plants would be nearly twice as likely to lose half their habitat than they would at 1.5°C, and sea level rise would increase by at least 10cm. While many world leaders met in Poland for the COP24 climate talks in December, it was already clear that we are nowhere near on track to attain the goal of limiting global warming to 1.5°C. Given we are currently already at 1.1°C, the Paris climate agreement in 2015 was non-binding, and the majority of the planet’s countries are still nowhere near doing what would actually be necessary to curtail emissions radically, we are on track to see at least 3.5°C warming by 2100, and much more after that. Yet it became known in 2017 that oil giants BP and Shell were already planning for global temperatures to increase by 5°C by 2050, even in the wake of the Paris climate agreement. Numerous reports have shown that it is highly unlikely civilization is possible at 3.5°C. There will be more and larger fires to come, and the price to be paid will continue to rise. Do We Really Have the Time and the Tools to Fix Climate Change? Yes, but the solution lies not in global techno-fixes but in respect for the land and the rights of people. Unprecedented warming in the Arctic could accelerate the pace of climate change.